Those who read the blog during the regular season knew that one of my most frequent topics broached was the use and misuse of JC (affectionately referred to as Jansas City) Romero. While it is clear from both his season and career statistics that he is absolutely filthy against lefties, he seems to lose his mind against righties. While his control is rarely spot on, he walks far too many batters, and righties much more so than lefties. It is my firm belief that Romero and closer Brad Lidge benefit much from wild swings of opposing hitters. Most of their strikeouts tend to come from sliders in the dirt. Don't get me wrong, while Romero is slightly wild, there is no one in the Phillies bullpen I would rather see face the oppositions power left-handed batters. 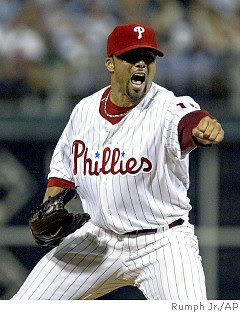 For whatever reason, since his acquisition towards the end of the 2007 season, Romero has been an enormously bright light in the Phils bullpen. Over his 95.3 innings pitched with the team, Romero has allowed 23 ERs (2.17 ERA). People probably think I'm crazy when I absolutely freak out and berate Manuel after each insertion of Romero to face right-handed batters. However, it should be understandable once people take the time to look at his splits throughout his entire career and realize that it probably isn't a good idea for him to face Chipper Jones and Mark Teixeira especially back to back. This past year, 4 out of every 9 right handed batters that JC faced reached base. That is far too alarming a rate to continually face righties to the extent that Romero faced far more righties than lefties this year. Some people make the argument that by turning the "Chipper Jones's" around, the Phils come out to benefit because they are better left handed hitters than right handed. In my opinion when the splits are as close as they are, it's like asking a murderer to cut off the right side of your body rather than the left because your heart is on the left side. You're going to die either way. Would you rather have Madson face Chipper (LHB OBP against .344), or Romero who's OBP against RHB is 100 points higher. I'll take Madson. While it might seem that I hate seeing Romero enter a game, I don't. I love his crazy antics, and the fire he puts in the team when he dances off the mound after recording the final out. I will never blame a bad hitter/pitcher (JC against righties) for performing badly, as expected. I will on the other hand criticize the manager who is too dense to realize that he is setting his team up for failure. During game 5 of the World Series, when Romero gave up the hit to Carl Crawford a lefty to start off the 8th, I was anticipating pure heartbreak with BJ Upton coming up. I was astonished when he got Upton to hit into a DP. Congrats Jansas, you're the first pitcher from Puerto Rico to record 2 wins in the World Series.